We spent last Shabbat in the mystical, holy, spiritual, handicapped accessible, slightly rugged ancient city of Tzfat. Our Shabbat began on a staircase balcony overlooking a beautiful upper Galilee sunset. The boys went to shul while the girls had their own minyan in a park. After Shabbat lunch, we met with a Kabalistic artist who was very passionate about tikkun olam (repairing the world) and gematria (the numerical significance of Hebrew words). On Sunday, we embarked on an eight hour bus ride to Eilat. One might say it’s the equivalent of driving from Boston to Miami. When we got there, we discovered the struggle of being part of a community of people who live in 106 degree weather. We continued to practice our Circassian ways to evade the heat. We finna snorkeled the next day in the Red Sea. The wild life and the coral reef were poppin. Ice skating was alright. At night, we had an inspirational, captivating, enthralling speaker about his new up and coming gap year program in Eilat. On Tuesday, we began “The Negev Experience” at Ben Gurion’s grave where we met our fantastic tour guide, Yuval. On Wednesday, we hiked until midday, at which point we stopped and took naps. We had transcendent experiences walking alone during the “golden hour” and wandered to our campsite where our fantastic, incredible, beautiful, fabulous TCs (technical coordinators) cooked us a gourmet dinner. On Thursday, we started off the morning with an intense hike up a mountain where many of us faced our fear of heights. After wearing the same clothes and not showering for 3 days we were relieved when we came across one of two springs in the entire Negev. It was refreshing (even though we felt just as gross afterwards) and we chatted it up with another tour group. 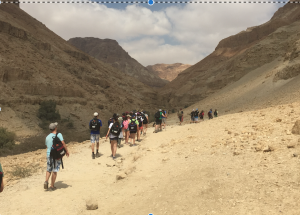 After resting during the midday heat we did trust activities with a partner guiding each other through the Negev blindfolded. On our third night in the Negev, after Jonah and Noah H. chased down a fox with a stick, we had a campfire and stargazed. We woke up early this morning (4 am) to see the beautiful sunrise after a “short” hike, and with that we officially finished the Negev challenge. Now we are off to our free weekend to spend Shabbat with family and friends. We are eagerly anticipating the showers to clean ourselves off from our 4 intense, exhausting, extreme, and powerful days in the desert. Even though Na’aleh won’t be together tonight for Relesh and Kabbalat Shabbat we will be thinking of all of you.